Concerns of Police Survivors (C.O.P.S.) 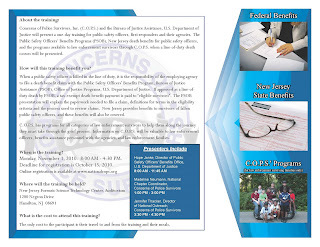 and the Bureau of Justice Assistance (US DOJ) have announced two free training seminars for law enforcement agencies in New Jersey and California. 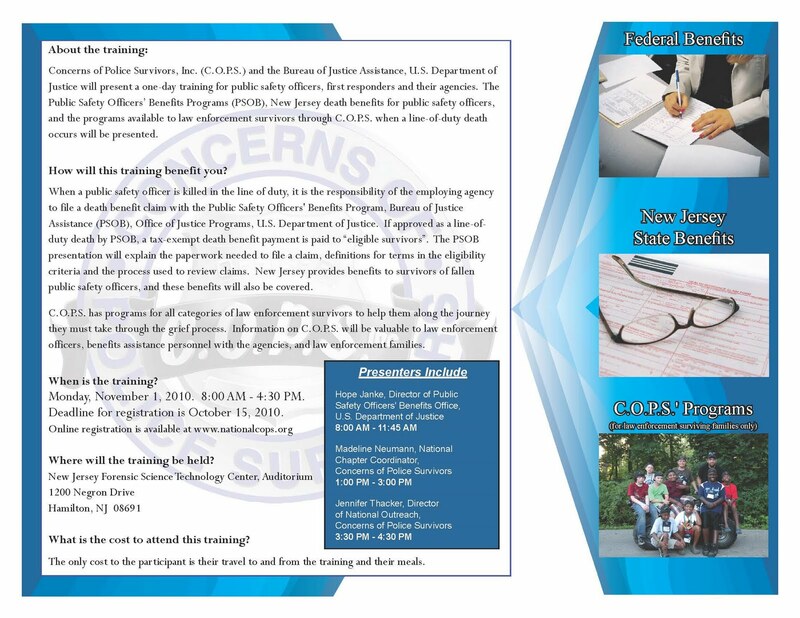 These one day training courses will cover the federal Public Safety Officers' Benefits Program, state-specific line of duty death benefits, and the programs made available through C.O.P.S. When a public safety officer is killed in the line of duty, it is the responsibility of the employing agency to file a death benefit claim with the Public Safety Officers' Benefits Program (PSOB), Bureau of Justice Assistance, Office of Justice Programs, U.S. Department of Justice. If approved as a line-of-duty death by PSOB, a tax-exempt death benefit payment is paid to “eligible survivors”. The PSOB presentation will explain the paperwork needed to file a claim, definitions for terms in the eligibility criteria and the process used to review claims. California and New Jersey provide benefits to survivors of fallen public safety officers, and these benefits will also be covered. C.O.P.S. has programs for all categories of law enforcement survivors to help them along the journey they must take through the grief process. Information on C.O.P.S. will be valuable to law enforcement officers, benefits assistance personnel with the agencies, and law enforcement families. Speakers at both events will include Hope Janke, Director of Public Safety Officers' Benefits Program (US DOJ) and Jennifer Thacker, Director of National Outreach (C.O.P.S.). Jennifer is also the surviving spouse of Kentucky ABC Investigator Brandon Thacker, slain in the line of duty on April 16, 1998. I have worked closely with both Hope and Jennifer and can personally attest to their commitment to helping survivors. Monday, November 1, 2010. 8:00 AM - 4:30 PM. Deadline for registration is October 15, 2010. Monday, December 6, 2010. 8:00 AM - 4:30 PM. Deadline for registration is November 17, 2010.